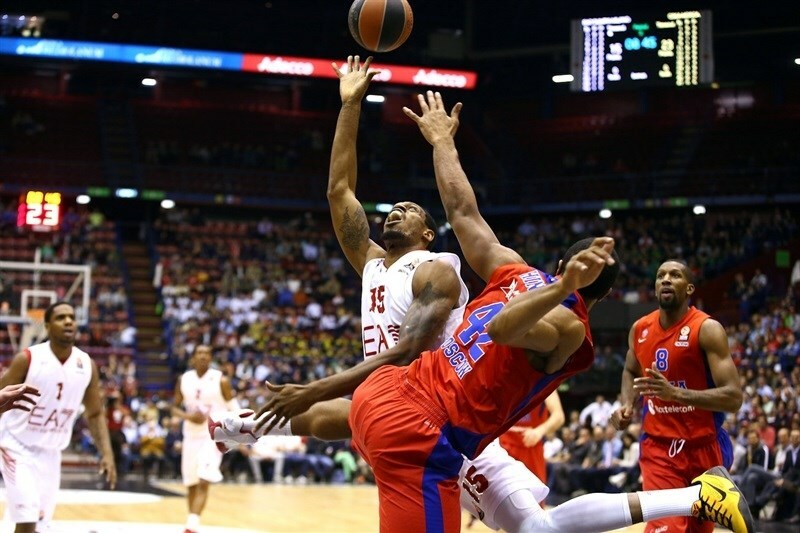 CSKA Moscow routed EA7 Emporio Armani Milan 79-88 on Thursday at Mediolanum Forum in a game that wasn’t as close as the final score would indicate. The result saw CSKA clinch first place in Group F with a 12-2 record. It will face Panathinaikos Athens in the playoffs. Milan dropped to 4-10 to finish the Top 16 in sixth place. 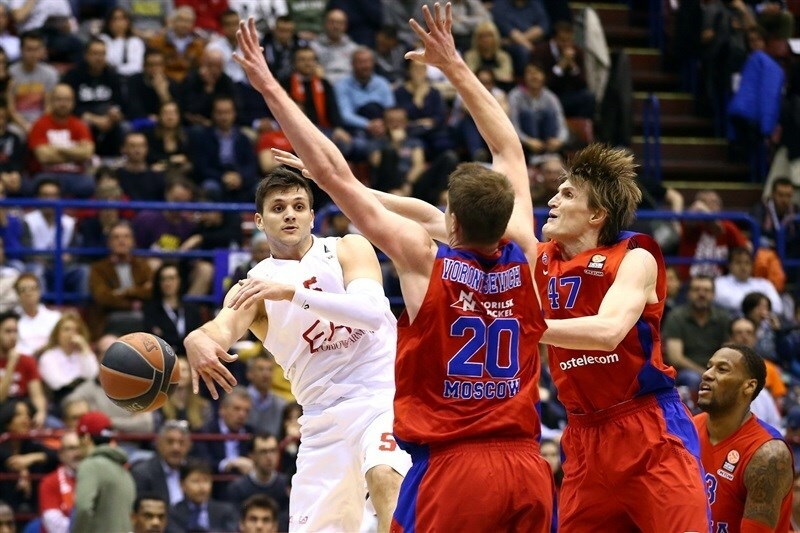 Sasha Kaun paced the CSKA attack with 19 points on 7-of-9 shooting plus 8 rebounds. 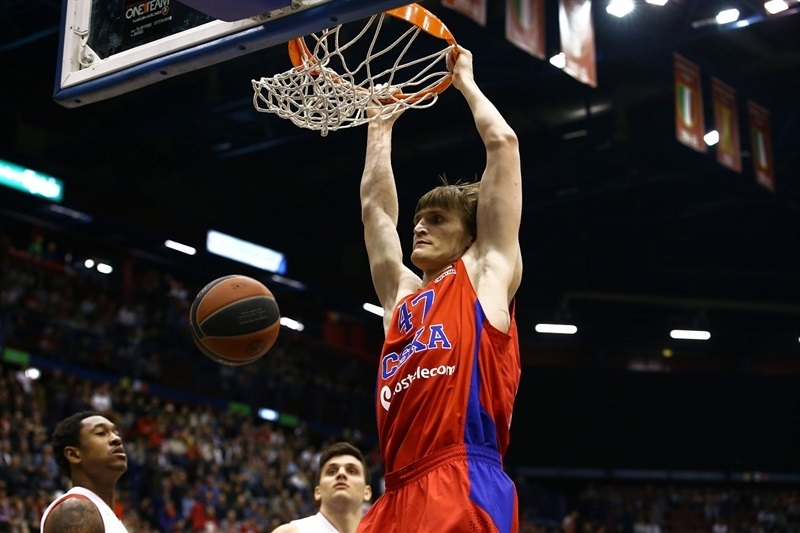 Andrey Vorontesevich and Andrei Kirilenko each added 14 for the winners, while Milos Teodosic dished 8 assists. 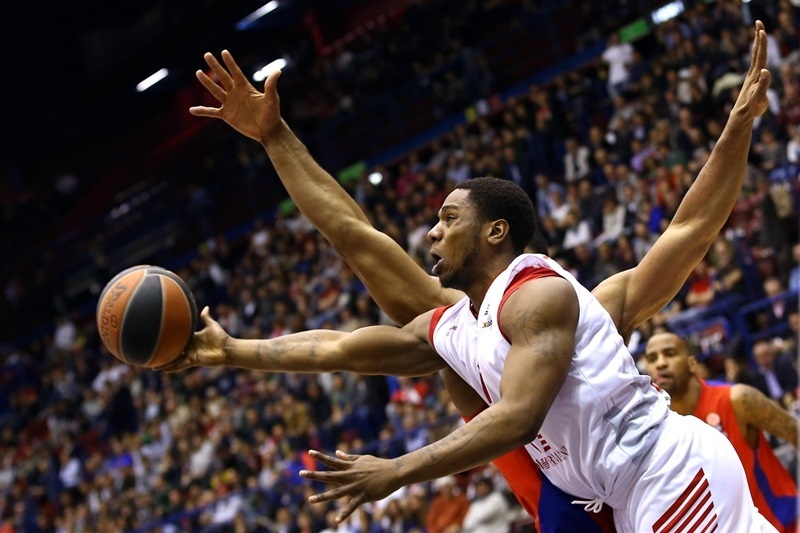 Samardo Samuels led Milan with 18 points, Alessandro Gentile scored 15 and MarShon Brooks 13 in defeat. CSKA built a double-digit lead in the first quarter and extended it into the 20s in the second quarter, which allowed it to cruise the rest of the way. Milan rallied to get within 9 later, but never seriously threatened the outcome. 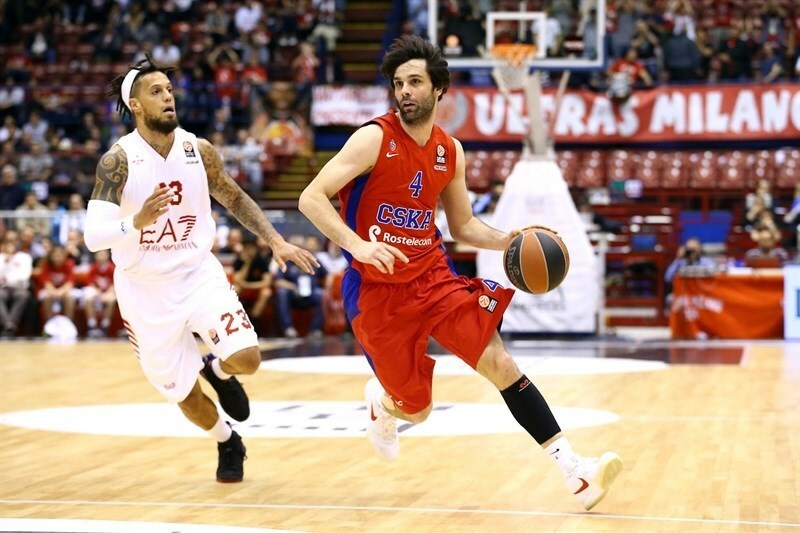 CSKA started strong with Vorontesevich blocking Alessandro Gentile at one end and Milos Teodosic delivering an assist to Kirilenko for a slam at the other. 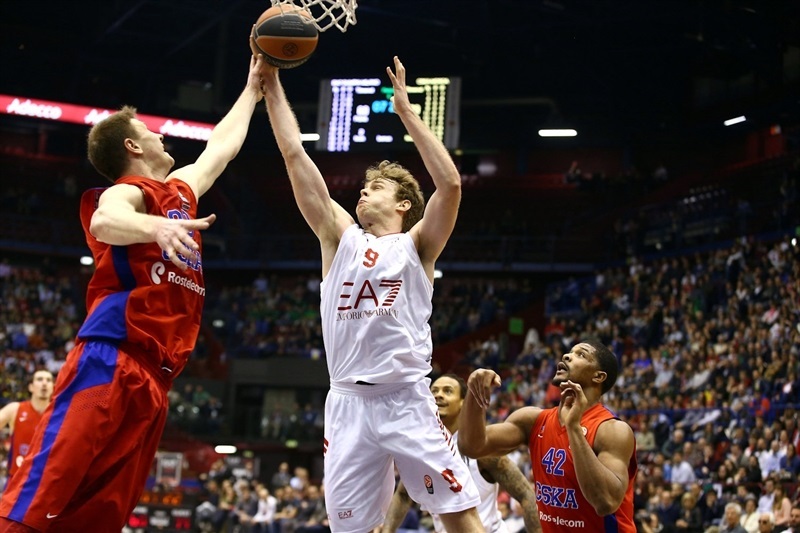 Nicolo Melli banked in a three for Milan’s first points. Teodosic assisted Kaun for another two-handed CSKA jam. The visitors’ brilliant passing continued as Sonny Weems found Kaun for another slam. Vorontsevich connected on free throws for a 3-8 lead. Kaun battled for a pair of offensive rebounds, which allowed Teodosic to whip another great assist to Vorontsevich for a slam. Gentile kept Milan alive with a triple. Kaun scored with a hook to make it 6-12 before Teodosic found a cutting Kaun for a basket-plus-foul. De Colo came off the bench for a lefty layup and a foul to take the difference to 12. 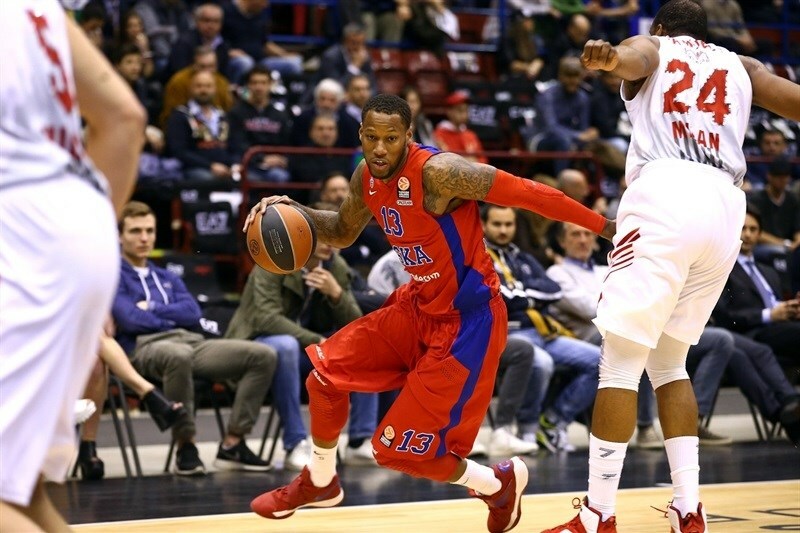 Daniel Hackett ended CSKA’s run at 8 straight points with a baseline jumper. David Moss added a short jumper, but Kirilenko was again the recipient of a great pass for a dunk. Samardo Samuels got going for Milan with 2 free throws. Manuchar Markoishvili created space for Kyle Hines for a slam. MarShon Brooks nailed a three to keep Milan within 15-23 after 10 minutes. Frank Elegar scrambled for a close range basket, but Demetris Nichols bettered that with a triple. After Joe Ragland scored a short baseline jumper, Aaron Jackson had a fastbreak layup and Kaun’s dunk made it 20-31. Gentile knocked down a jumper, and after Jackson nailed a triple for CSKA, Gentile drove to the hoop for a three-point play. However, Kirilenko elevated for a put-back dunk, and Vorontsevich got a lucky roll on a three for a 25-39 lead. Teodosic added a triple of his own, and after a timeout Vorontsevich and Weems continued the three-point barrage with back-to-back shots for a 21-point difference. Samuels fought for a put-back dunk, Melli hit a triple and Gentile drove for a layup to get Milan within 34-51, but Kaun made a pair of foul shots and Markoishvili ended the half with a long baseline jumper, for a 34-55 advantage. Teodosic whipped another pass to Kirilenko for a slam. Samuels scored a put-back at the other end. Teodosic fed Kaun for another slam. Samuels scored 2 from the line for Milan. Teodosic lobbed an alley-oop to Kaun for a layup. Brooks drilled a three for the hosts to close the deficit to 41-61. Melli added a layup plus foul. The matchup between Hackett and Teodosic grew testy when the latter drew an offensive foul. Brooks’s layup made it 46-52 midway through the quarter. Hackett drove for a layup to the delight of the fans. Vorontsevich countered with a foul line jumper. Samuels scored 5 straight points with a basket-plus-foul and finish underneath to get the hosts within 14. After Kirilneko made 2 free throws and Hackett missed 2, Hines pushed the difference to 18. De Colo free throws made a 20-point difference. Brooks’s tough layup made it 55-73. Hines and Samuels traded offensive fouls and later free throws. De Colo drove for a layup, but Samuels continued to attack inside. He made a tough layup and then a dunk. 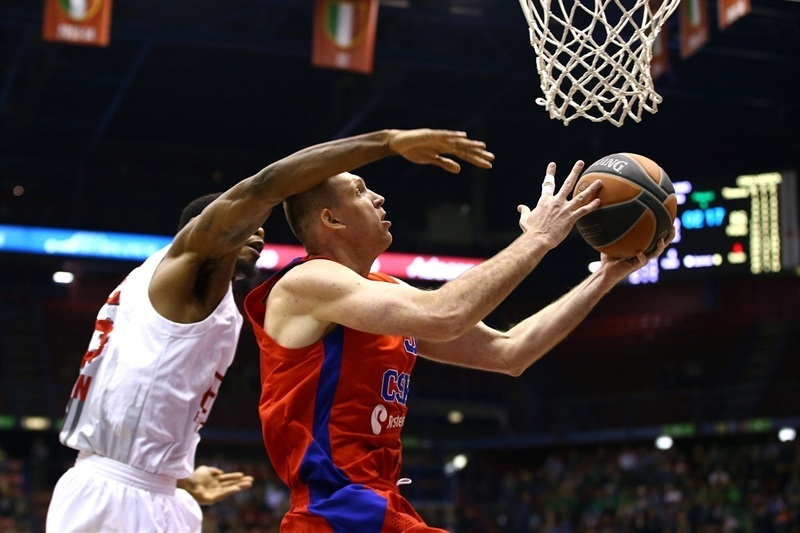 Jackson drove for a layup to keep CSKA in control. Linas Kleiza drilled a three with seven minutes left. 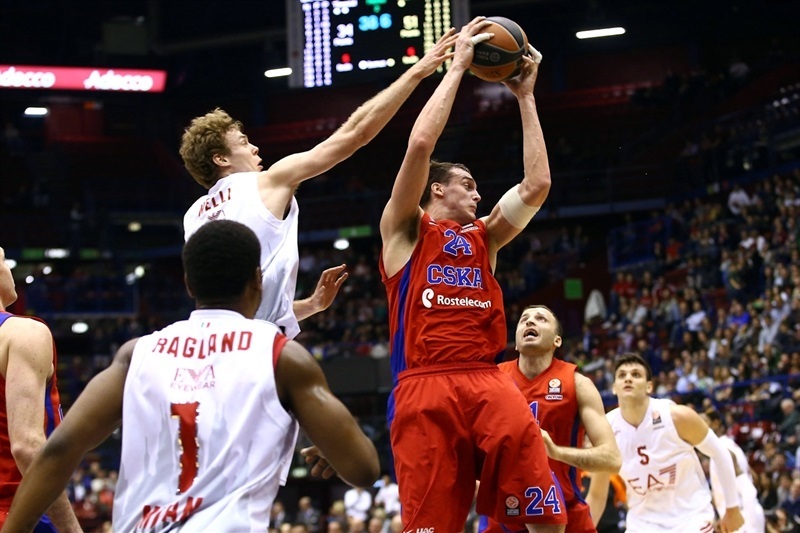 Milan managed to slow CSKA on defense, but was unable to generate any offensive momentum. Weems hit a three to make it 63-82. Victor Khryapa’s first points pushed CKSA’s advantage back into the 20s. Gentile answered with a triple. Kleiza added 2 free throws and Ragland drove for a layup. Khryapa scored again, but Milan still believed. Gentile scored on the offensive glass and Brooks converted a three-point play. Ragland cut the deficit to 77-86 with a baseline layup. 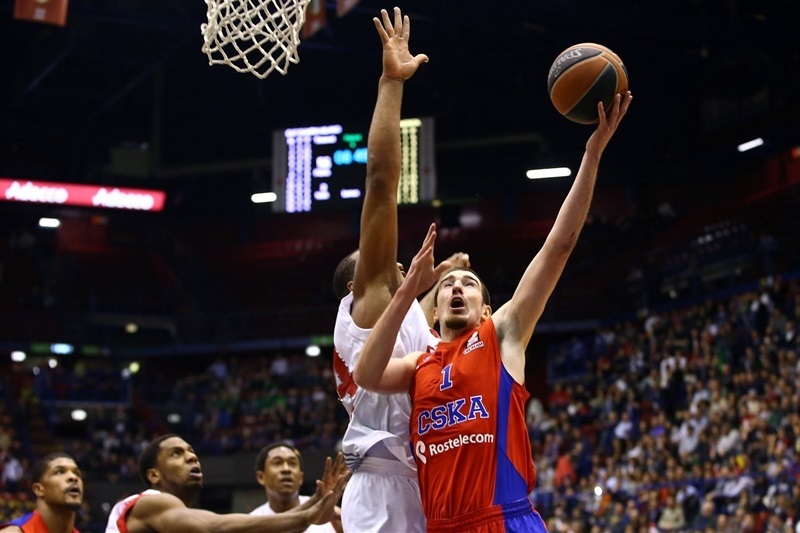 But any doubt was erased by free throws by De Colo and Kaun as CSKA cruised to the victory.